For Yamalube/Star Racing Yamaha’s Cooper Webb, the 2016 Budds Creek AMA 250cc National should’ve been an easy day at the office. Webb came into the penultimate round of the 2016 Lucas Oil/AMA Pro Motocross Championships with 81 points in hand over a tie in second place between teammate Alex Martin and Monster Energy/Pro Circuit Kawasaki’s Joey Savatgy, which meant all Webb had to do in the first moto was finish third or better, no matter where his competition finished, to clinch the championship with three motos still left to run. Webb started the day looking fairly dominant, putting down a 2:02.7 in qualifying to put him at the top of the charts, about a half-second or so in front of Savatgy. This gave him the first gate pick and a presumed much easier time clinching the title in the opening moto. But Webb got a poor jump off the gate, then was caught up in a first-turn crash when another rider went down in front of him. Starting 38th in the moto, he made his own situation worse when he went down a second time while battling Kyle Cunningham for 25th place later in the first lap, as their lines came together and Webb fell again. Webb restarted his charge in about 28th place. Meanwhile, Savatgy’s teammate Adam Cianciarulo was out front and flying, snatching the holeshot and pulling away from Martin, Jordon Smith, Savatgy and his rookie teammate Austin Forkner, and Forkner was fighting off the advances of Yamaha’s Bradley Taft, who was competing in his second-ever 250cc National after moving up from the amateur ranks following Loretta Lynn’s. Behind Taft came the Rockstar Energy Husqvarna duo of Zach Osborne and Martin Davalos, then Martin’s teammate Mitchell Harrison, and Luke Clout. 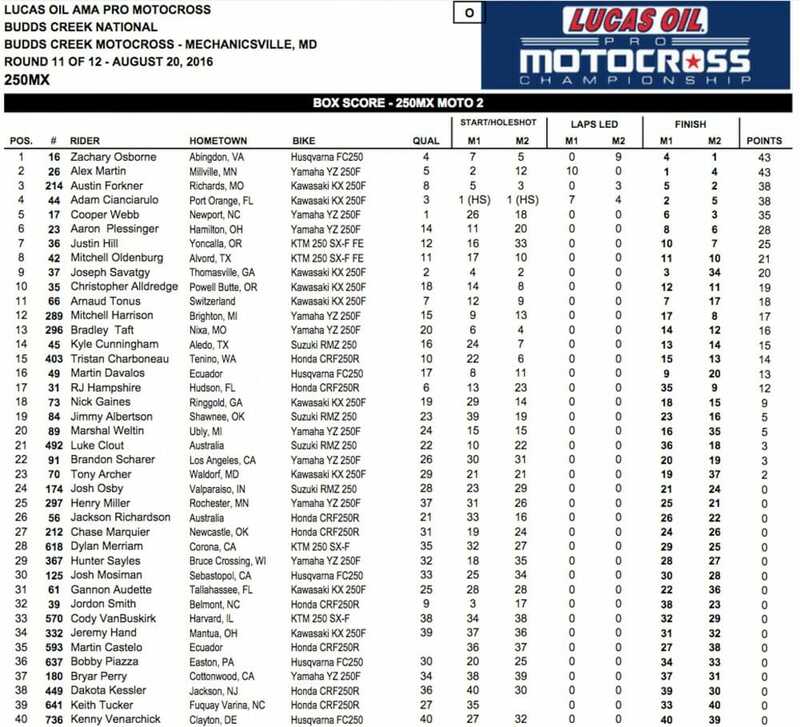 Savatgy found his way by Smith before the halfway point, but by that time he was a long way behind Martin, and especially the fleeting Cianciarulo, until Cianciarulo went down on his own when he washed his front end over the berm in one of Budds Creek’s many off-camber corners. This handed the lead to Martin, but Cianciarulo picked himself up and started eating back into the lead again. With three laps to go, Cianciarulo had caught Martin, but the two crossed the finish line with only 10 seconds to go in the 30-minute timed portion of the moto, meaning they still had fully three laps left to run. Cianciarulo pressured Martin for the lead, only to physically run out of steam in the late going and settle for second in the 36-minute and 13-second moto run in high humidity and temperatures over 90 degrees Fahrenheit. Martin took the moto win over Cianciarulo, Savatgy, Osborne and Forkner, while Webb was able to claw his way up to sixth place. With his teammate Martin taking the moto win, sixth wasn’t enough to clinch the title outright. That would have to wait a couple more hours. Webb again didn’t get a great jump off the gate, and tangled momentarily off the line with teammate Martin, while Cianciarulo grabbed yet another holeshot in front of his teammates Savatgy and Forkner, while again Taft found himself battling near the front in fourth, with Osborne right behind him. Webb started well outside the top 20 and rounded lap one in 18th. Martin faired better, rounding the opening lap in 12th. Forkner showed a lot of early speed, passing Savatgy for second, then chasing down Cianciarulo and going around him as well to take the lead. Osborne simply followed him through the top two, and then at the halfway point, Osborne made an aggressive move on Forkner in the rollers before the finish line and they slammed into each other. Forkner was forced out of the way while Osborne took over out front. Forkner tried to put up a fight, but couldn’t reel Osborne back in and ultimately had to settle for second. Earlier in the race, on lap four, Savatgy dropped another spot to teammate Arnaud Tonus, then began to slide backward. At about the halfway point, Savatgy got passed for fifth place by heated rival Webb, then Martin for sixth, Aaron Plessinger for seventh, then three more riders a lap later, and four more a lap after that. Then Savatgy exited the moto for the second time this season due to heat exhaustion. Webb carried his teammate Martin up through the field until Webb grabbed third with three laps to go, and Martin slotted in right behind him in fourth a lap later. At the finish, it was Osborne winning his first career AMA 250cc MX moto over Forkner, Webb, Martin, Cianciarulo, Plessinger, Troy Lee Designs/Red Bull KTM’s Justin Hill, Harrison, GEICO Honda’s RJ Hampshire, and Hill’s teammate Mitch Oldenburg. The moto win also gave Osborne his first-ever AMA National overall win (with a 4-1 score), ironically at the same track that saw him lead more than half of a moto 10 years earlier as a rookie before fading out of points-paying positions. The 2006 performance unfortunately highlighted Osborne’s incredible speed and lack of fitness, which ultimately led to him being forced to take a ride in the GPs for over a half-decade before returning to the USA. Martin ended up second overall with a 1-4 over Forkner’s 5-2, Cianciarulo’s 2-5, and Webb’s hard-fought 6-3 for fifth overall. 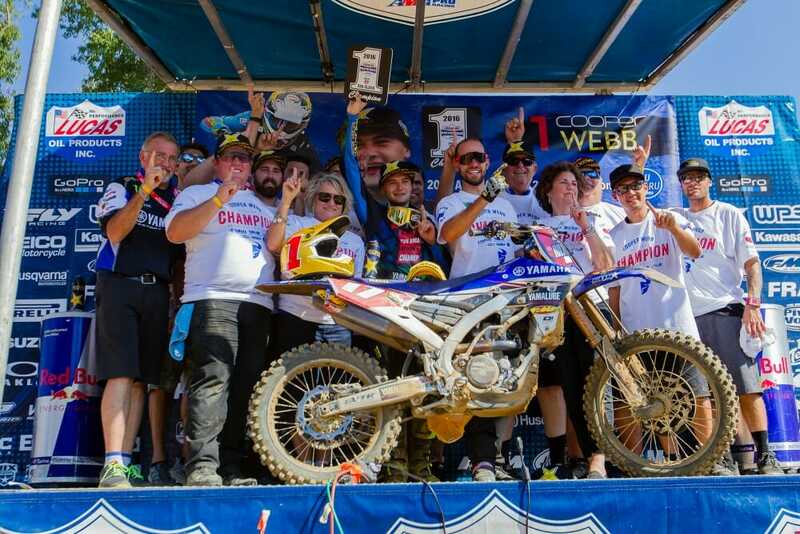 However, it was plenty enough for Webb to take the championship—his first-ever national championship, adding to his two consecutive 250cc Regional Supercross titles. Webb will be able to choose a single-digit number for 2017 and beyond if he would like. His choices as of now are two, eight and nine. The series now heads to its final round in Indiana in a week’s time.